It was at that restaurant where the Mexican waiter, upon learning that three of his customers were from Poland, announced that he's always wanted to visit Germany—but wait, I'm getting ahead of the story. Krzysztof, Henryk and Michal had arrived in Oregon for Labirynt's first US tour. We rehearsed in the Cascade Mountain town of Camp Sherman and were recording our third CD (the one you hold in your hands) at Michael's studio in Sisters. Ahead of us lay a series of concerts from the Coast to the Cascades, from Portland to Eugene. And so it was at that Mexican restaurant in Sisters that a young girl offered to Krzysztof the gift of an elaborately-folded and tied tissue. "Me and my friend like to invent things," she told us. 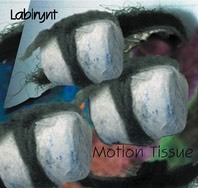 "This is a motion tissue." Well, we like to invent things too; and so we offer to you, the listener, our own Motion Tissue. Pay it forward.